Spellbinder Entertainment – Theatrical Magic: NEW- A Victorian Gentleman’s Nob Hill Walking Tour! 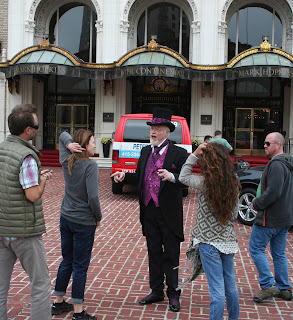 NEW- A Victorian Gentleman’s Nob Hill Walking Tour! As you know I love talking about San Francisco’s legend, lore, and history. All the wonderful and eccentric people and places. So I’m starting a walking tour! I’ll guide small groups around town, and yes, there will of course be some Magic involved! I’m really excited to bring some of the intriguing tales from my San Francisco Magic Parlor shows onto the streets and actually walk people around my favorite sites in my favorite town. Here’s a sneak-peek at the Time Machine Travel website. I hope you can join me this Summer and experience my city like never before! If you’re local I’d love to show you new things, if you’re from out of town come back and visit us!